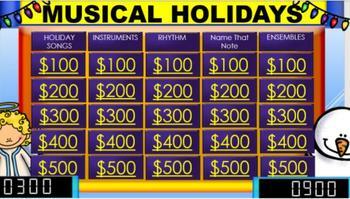 You'll love Musical Holidays - a Jeopardy style game show! 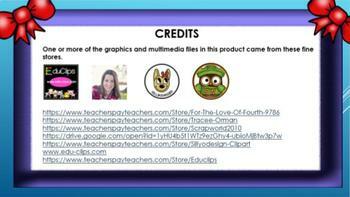 This product is fully interactive with sound clips and video files to enrich the learning of your students. 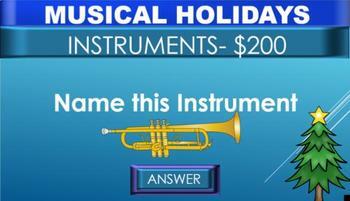 Educational topics follow a holiday theme and provide a fun way to reinforce fundamental music education concepts. Your students will have a blast competing with their peers as they prove who "really knows more." Be sure to keep score and turn this activity into a fun learning experience students will remember. 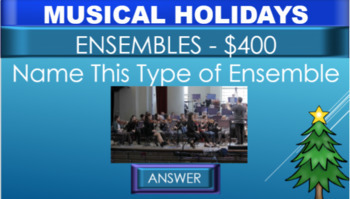 If you have any problems please contact me at 4themusiceducator@gmail.com. Once satisfied with the product I do ask you to provide any positive feedback you might have. My success = your success. This file is designed to function with with a smartboard or projector and speakers for sound. It is a powerpoint file and should function as easily as a "normal" presentation. However, I do ask that you preview the presentation prior to presenting it to students so you can can adjust any sound levels if needed. To do this click the small black box or audio icon in the bottom right of a slide and an adjustable volume control icon appears. Just make the adjustment, louder or softer, and you are in business. Be sure to put the slide show in presentation mode to start the fun! Please be sure to follow me by clicking the star. This will alert you to any new products added to my store. Thank you!